As a digital photographer I find I use Adobe Photoshop Lightroom almost as often as I use Adobe Photoshop. 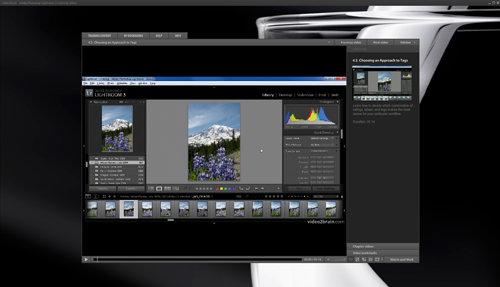 Adobe Photoshop Lightroom 3 is the current version and is a powerful software program for digital photographers. The advantages about using Adobe Photoshop Lightroom 3 are the non-destructive editing features, cataloging and organizing images, slideshow and web gallery options, and the ability to print from the application. I recently reviewed Adobe Photoshop CS5 Learn by Video and was impressed with this well-produced series by video2brain. This handsomely packaged 10 hour instructional DVD and 120 page reference guide is all anyone needs to familiarize themselves with the application and achieve proficiency in a short amount of time. The DVD lessons are presented by Tim Grey, digital photography author and educator, and Mikkel Aaland, documentary photographer, author, educator, and world traveler. 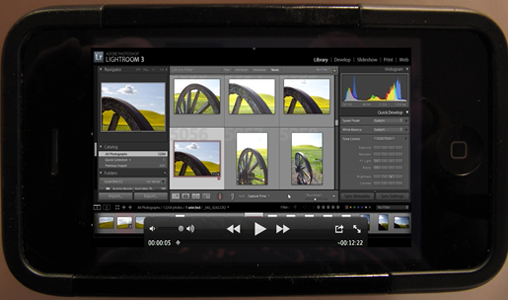 The video chapter layout is thoughtfully organized to guide the viewer about the newest features in Lightroom. The first chapters explain in great detail the basic functions of importing images, RAW dialog, when and how to convert to DNG (Adobe’s digital negative file format), and collections. 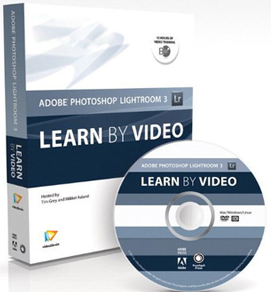 The remaining chapters are a comprehensive overview of Adobe Photoshop Lightroom 3 modules (Library, Develop, Slideshow, Print, and Web) with self-tests after each chapter. I appreciated the time spent on organizing photographs using keywords, tags, ratings, presets, GPS metadata, and file handling. When a photographer is importing hundreds of images, Adobe Photoshop Lightroom 3 makes the task of organizing, making collections, and searching for images very efficient. Major changes in Adobe Photoshop Lightroom 3 include improved algorithms in raw conversion, noise reduction, and sharpening. The presenters explain the benefits of each and how to convert images from the 2003 process version to the new 2010 upgrade version. Tim and Mikkel describe the different non-destructive editing choices in the Develop module including local and global adjustments, workflow, HDR (high dynamic range) images, slideshow and printing options, custom print packages, tethered shooting, and creating HTML and Flash web galleries. 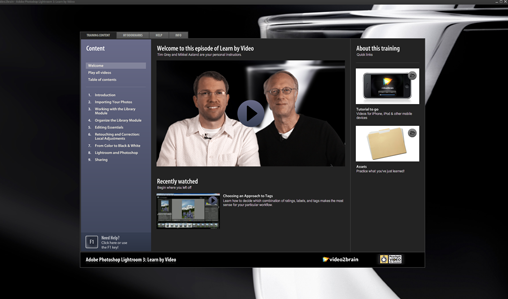 The Learn by Video series has tabs available for bookmarks, content, help, and an option to return to the video. The videos average from two minutes to eighteen minutes in length. The helpful feature “Watch and Work” allows the viewer to minimize the instructional screen while working in Adobe Photoshop Lightroom 3. Included in the DVD is a folder with video tutorials that can be downloaded on mobile devices. Interestingly this DVD does not allow closed captioning which was offered on the Adobe Photoshop CS5 Learn by Video DVD. Like many photographers, I have an Adobe Photoshop Lightroom to Adobe Photoshop workflow. I use certain features of both applications, for example I prefer to sharpen my images using Adobe Photoshop but I like the print package option in Adobe Photoshop Lightroom. The authors appreciate the fact that photographers go back and forth between the two programs when editing images, and they explain the advantages of a workflow in each application. Although I’ve used Adobe Photoshop Lightroom from the beginning, I feel I learned some invaluable information about the software. I like to dive in and then read directions later but I found I can streamline my photographic workflow and save time with the tips that are generously provided. The booklet opens with a forty-eight page chapter “The Photographer’s Eye” by Michael Jordan, the fine art photographer. It is a beautifully written tutorial that concerns itself more with the aesthetics of picture taking and the analyzation of composition. This was a pleasant surprise, to have a photographer write about the intellectual process of photography and not equipment. The remaining chapters discuss in detail the new features of Adobe Photoshop Lightroom 3 and include eight pages of keyboard shortcuts and a glossary. It is difficult to find any flaws in this elegantly packaged set. The content is very well-presented and would be helpful for the beginning and intermediate user of Adobe Photoshop Lightroom 3, especially if they are new to the Adobe Photoshop Lightroom software. It is rated as beginner, but photographers desiring to know more about the application would also find it helpful. I think video2brain has done a terrific job in packaging a lot of information that is accessible and relevant. A Bundle of Mac Joy!